Happy Thanksgiving Eve to you all. I hope you've got your feast and festivities all planned out. I know I do. Yes, after work tonight I'm headed to the grocery store to pick up my traditional, non-traditional foods. See, I've never been a big turkey, mashed potatoes and gravy guy. So the past few years I've alternated between my personal favorites: my home-made spaghetti sauce, my favorite pizza, and lately, my dad's home-made meatloaf. That may not sound so appetizing to some of you, but don't knock it til you've tried it! So I'm pretty sure I'll be going with the meatloaf, a big baked potatoe (copyright Dan Quayle) and my one nod to a traditional Thanksgiving, a slice of pumpkin pie. So that's my feast, as for my festivities? I found out last night that the Sci Fi channel of all places is going to be running "Goldeneye", "The World is not Enough", and "Tomorrow Never Dies" back-to-back-to-back starting at 3pm central time. Add it a couple of my own DVD's and I'm pretty much covered for the day! Yes, I'm odd. But I'm very happy in my oddness, so cut me some slack! On to today's column. 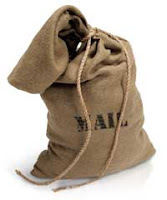 Today it's the return of the Sports Take Mailbag. It's a great question and even as I write this, I'm not entirely sure how I'm going to respond. Oooooh, what a tease! Then it's this week's version of the DFTU. So let's get to it! "I have been through some terrible things in my life. Some of which actually happened." It's possible that I've embellished one or two stories in my life to make them just a touch more traumatic-sounding for comedic effect. But that's only because I live to entertain the people. And if that's wrong, then I don't want to be right! First up today, it's the return of the Sports Take Mailbag. Remember, if you've got a question that's been rattling around in your mind, send it to me at: dcook93@yahoo.com. I won't guarantee a factual answer, but I'll do my damnedest to keep you entertained! Obviously, the number of seasons coached aren't the same, but the numbers are eerily similar. Is there any reasonable justification that the administration can make for keeping Charlie Weis based on their past expectations of coaches? Excellent question Josh. I guess it all hinges on how we're going to define "reasonable". I was having a discussion with a fellow college football fan yesterday when the subject of hiring and firing coaches came up. It's my contention that there's one great trap that schools with histories of strong football programs can fall into. When expectations are unreasonably high, coaches are under extreme pressure. Win a measly 8 games? Clearly the coach has to go! We'll go hire another guy. And if that guy doesn't win a National Championship in 3 years, we'll fire him too! The problem is, after a while, you're going through 4 coaches every 10-12 years and your program has lost any sense of stability. And if you don't think that has a direct impact on recruiting, you're kidding yourself. Make no mistake, when a coach talks to a recruit, they're talking just as much about why that kid shouldn't go to school X or Y as they are about why the kid should come to their school in the first place. Now I'm not saying that you should retain an under-performing coach simply for stability's sake. But I do think that it's important to keep that factor in mind when you're looking at the big picture of where your football program is headed. So let's take the specific case of Charlie Weis. Not only does he have the exact same winning percentage as Ty Willingham when Ty was fired, but he'll actually have a worse one by the end of this season, when they get done getting whacked by USC this weekend. So if Weis has performed at a lower level than Willingham did, and you said upon firing Willingham that his performance was unacceptable for a coach at Notre Dame, then how can you justify keeping Weis? On a purely fairness level, clearly you can't. But when you take a pragmatic view of the situation, I think you can see how it's likely that Weis will retain his job. Argument 1: Weis is still under the contract that's scheduled to pay him $30 million over 10 years. I'm sure there's a buy-out clause where the school can get out of that contract at a reduced rate. But I'm equally sure that the rate in question would not be cheap. Argument 2: As I mentioned previously, sooner or later you have to stick with a guy. I'm not saying that Weis is necessarily that guy, but Notre Dame is coming dangerously close to becoming a revolving door for coaches, and that would severely tarnish the reputation of their football program. I'm not really a Notre Dame guy (though my father whom I respect and admire is), so this doesn't necessarily hit me where I live. But I think it's an interesting debate. How big should the "big picture" really be? If you have any thoughts, please attach them in the comment box below! Finally for today, it's time for everybody's favorite segment: Dan's Favorite Teams Update! Wisconsin Badgers (football): The Badgers have finished the regular season 7-5 (3-5 in the Big Ten). If you didn't catch Monday's column, I talked some about Wisconsin's overtime win against Cal Poly. But permit me to expand on my feelings somewhat. Had Cal Poly pulled off the upset, it would've been only slightly less of an upset than Appalachian State's win at Michigan last year (sorry Hammer, but I needed a reference point). This is a team that a focused, well-coached Wisconsin team should've blown off the field. Instead the Badgers came out flat and lacking energy and never really got on track. That's evidenced by the fact that their only lead of the game came in overtime when they won it. That's just embarrassing. But let's face it. This whole season has been something of a train-wreck. From the 0-4 start to the Big Ten season, to losing to a re-tooling Michigan team who did everything they could to give Wisconsin a win on the road. So I guess in the end, Badger fans just have to go with "a win's a win" and look forward to their bowl game. It appears more and more likely that Bucky will be headed to the Insight Bowl in Tempe, AZ on December 31st. No, it's not a January 1 Bowl. But it's a helluva lot better than going to Detroit on the day after Christmas (sorry Gopher fans)! Minnesota Wild: The Wild are 12-6-1, good for 25 points and 2nd place in the Northwest Division. Vancouver has been on fire lately. 8-0-2 in their last 10 has put them 5 points ahead of the Wild in the Northwest race. Last week I bragged on the fact that the Wild were playing 7 of their next 8 at home, and how that should help them put together a solid streak. After winning a solid game against Pittsburgh on the road, the Wild proceeded to drop their first two home games of this stretch against Vancouver (understandable) and St. Louis (inexplicable). Monday night they defeated Washington to get off that schneid. Unfortunately, even that win was shaky. The Wild roared out to a 4-0 lead which they held until the final 10 minutes of the 3rd period where they gave up 3 goals in a 4 minute span to make the game far closer than it should've been. So what's been the trouble? A big part of it has been a lack of offense. The Wild have had a disturbing history of disappearing offensively from time to time. And to make matters worse, when they do, they start pressing trying to make something happen which hurts their usually solid defense. I'd like to say that things get a little easier for the Wild with the Brendan Morrow-less Stars and hapless Tampa Bay Lightning coming into town. But based on their recent struggles against lesser competition, obviously nothing's guaranteed. After those two games tonight and Friday afternoon, the Wild take a short road-trip to Nashville on Saturday before returning home for three against Colorado, St Louis again and Vancouver again. I guess they'll at least have a chance for a couple of revenge wins! That's all for today. Usually Thursday is my cornucopia of college football. But given the holiday, there's a strong chance that column will be delayed til Friday. We shall see. Until then, I hope you and yours have a very happy Thanksgiving! And thanks for reading! I'm thankful for meatloaf, meat sauce, non-mashed potatoes, and James Bond. Maybe the Pilgrims didn't have them, but if they did, they'd have been thankful for those things, too.